TBS Drama. Ôoku: Tanjô (Arikoto/Iemitsu) (『大奥：誕生』[［有功・家光篇]). Release date: Oct. 2012. 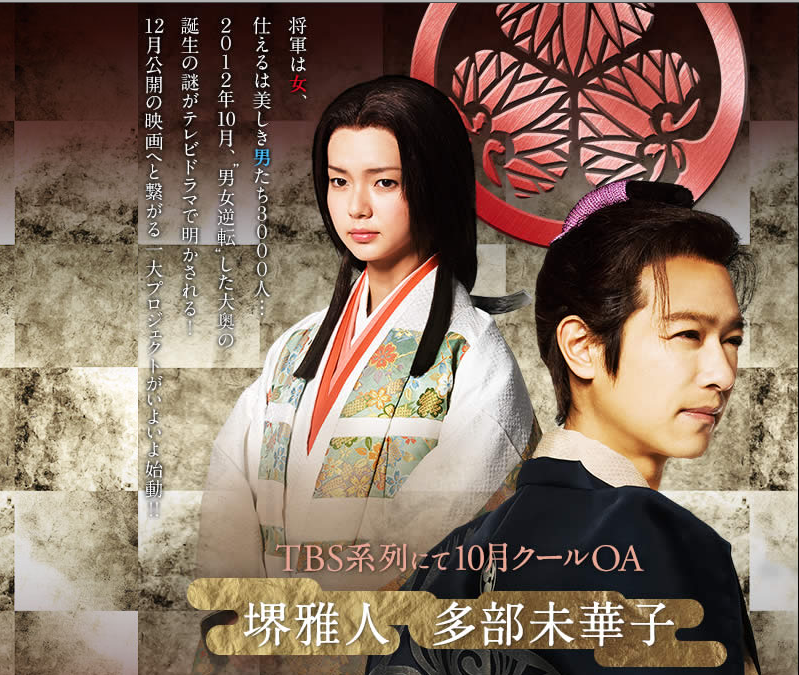 Instead, TBS presents non-emoting Tabe Mikako (多部未華子) and non-emoting Escher-girl-necked Sakai Masato (堺雅人). (Plus, they cut off the iconic design on his kataginu!) 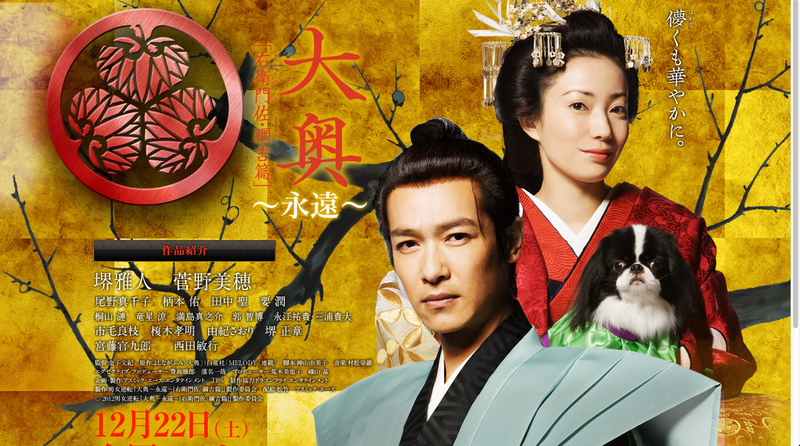 This doesn’t look like a drama featuring the best love story and treatise on gender in society since The Rose of Versailles (BeruBara), this looks like Yet Another Boring Period Drama Set in the Ôoku. Even if they are still basically the main cast lined up, we get a much better sense of the characters. Yoshimune looks every bit a confident shogun; Mizuno looks tough but a bit apprehensive. Those two engage our vision and look straight at the viewer; they are the same size, but Yoshimune is placed higher to illustrate her power; Mizuno occupies the foreground to illustrate his role as protagonist. All the supporting characters, not just the women, are turned and looking in other directions, and we can see in just one photo a look into their personalities. Along with posters, you need photos to provide a reason to go see the show/film. For the first Ôoku, this was one of the images that was featured in movie magazines like Cinekon and, to me, one of the most iconic visuals of the film. シネコン. August 2010. pp. 26-7. I’m just not feeling it with this promotion for the TV series. It’s like TBS is saying “Oh, hey, Ôoku fans. Here’s a show you’re going to watch because you love the first movie and manga.” Impress me, TBS! I know you can do more dynamic work, like NHK did with Haken no Oscar. Just because you have an existing fan-base doesn’t mean you don’t get to put in effort! Look at those covers, especially back-to-back. The concept is simple, but it showcases very complex facial expressions–apprehension, doubt, pity, longing. Why not have them looking at each other or back to back or trying harder with establishing a connection between the two? Hopefully there will be better pictures coming. Film. Ôoku: Eien (Emonosuke/Tsunayoshi) (『大奥：永遠』[［右衛門佐･綱吉篇]). Release date: Dec. 22, 2012. Luckily, where the TV promo falls flat, the promotional image for the film is excellent. Both Sakai and Kanno Miho are engaging the camera, and his serious look is much more suited to Emonosuke, whom I would describe as Arikoto’s doppelganger with chronic bitchface. 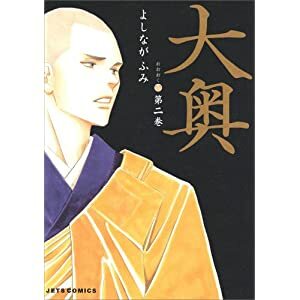 I think Kanno, who was amazing as Matsukata in Hatarakiman, is going to be a perfect Tsunayoshi. I love the combination of playfulness and uncertainty in her expression here. The Pekinese is an excellent touch, given the plot line about Tsunayoshi’s policies protecting dogs. 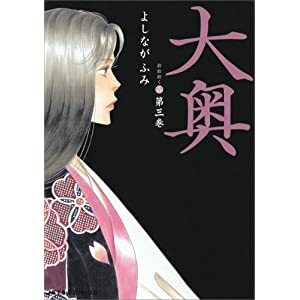 On the bright side, director Kaneko Fuminori will be reprising his role as director of both the film and the drama, which gives me have faith in his bringing Yoshinaga’s vision to the screen. Also, Matsumura Takatsugu will be composing the music for the film, which means another spectacular score. I can’t wait. Here’s to hoping for something worthy of a Barrowman-style reaction! UPDATE: Trailer for the film here! *Why are all the male characters getting top billing on the arc titles? Mizuno x Yoshimune, Arikoto x Iemitsu, Emonosuke x Tsunayoshi. I guess for movie 1, we start out with Mizuno as the protagonist and see most of the film from his POV. But Iemitsu and Arikoto are more evenly divided, and Tsunayoshi is in the plot way longer than Emonosuke. If we’re going from a purely fanfic reading of the order of the pairing where you have top/bottom, I assure you that Yoshimune and Iemitsu belong in the front. Of course! It’s Matsumura Takatsugu. My copy of the OST, which I got on Japanese iTunes, actually had his name in romaaji even though everything else is in Japanese, so look for that one name on the CD case! I love the soundtrack, so I’m really excited to about the OSTs for the drama and film.